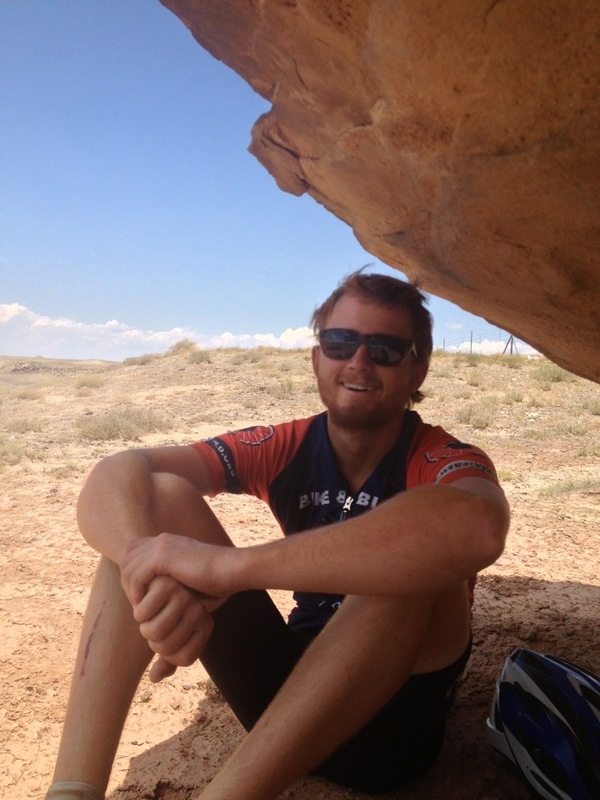 Day 50: Day off in Durango!!! 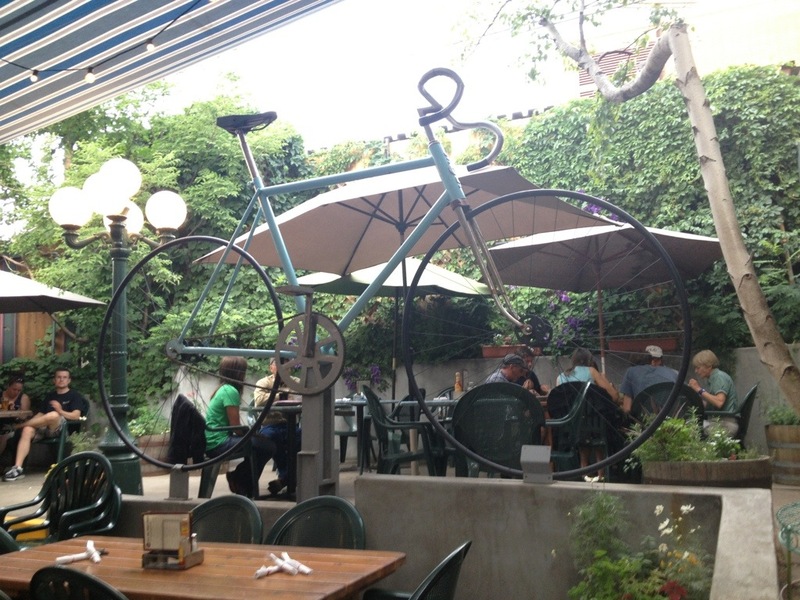 While we all love riding our bikes (we wouldn’t be on this trip if we didn’t enjoy it), a day off is definitely an event we look forward to… Especially when it’s in a cute Colorado town like Durango! I woke up at 9:00am on this day, which is the latest I’ve slept in since before the trip! It was much needed. Then I went to relax and get breakfast at a local coffee shop. Some of my teammates were already there! One of the most fun aspects of being in a town with 26 of your friends is that you can walk around town and you’re guaranteed to find someone you know. It makes a place feel more familiar and homey when you can walk down the street, see a teammate, and find out what they’re up to. Those of us who forgot to take off our reflective safety triangles from our backpacks made it especially easy to spot them in a crowd. 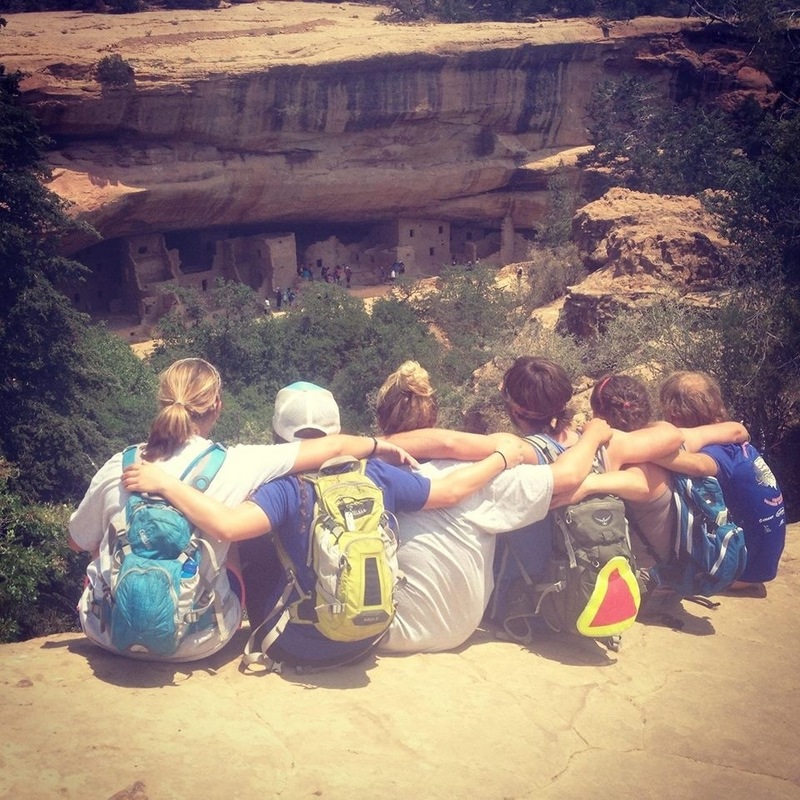 After coffee, I went to Mesa Verde, a Native American ruin, with a group of B&Bers. Luckily, we got to take the van there (you really couldn’t pay me enough to ride my bike on an off day). 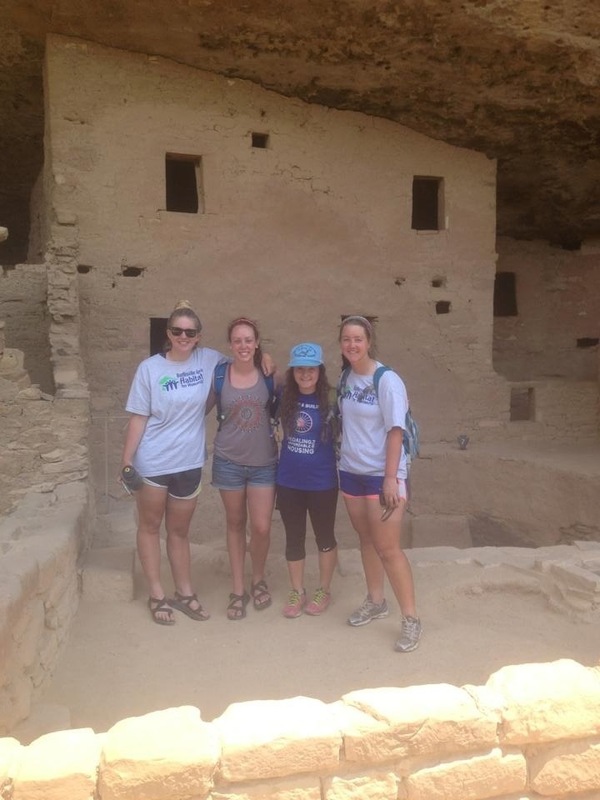 Although we didn’t get to stay for very long, it was cool to see these ruins up close! When we returned, we followed some locals that we had met the night before out to a waterfall jumping spot! Meg and I chose not to go waterfall jumping, but rather to hike along the river (it was sort of a procession of waterfalls that increased in size) and watch our friends in the icy cold water. Another incentive to stay out of the water was that Meg had bought beer, and she was going to let me have a “wilderness PBR” as we waited for our friends to brave the river. Plus, the hike allowed for some scenic views along the way! 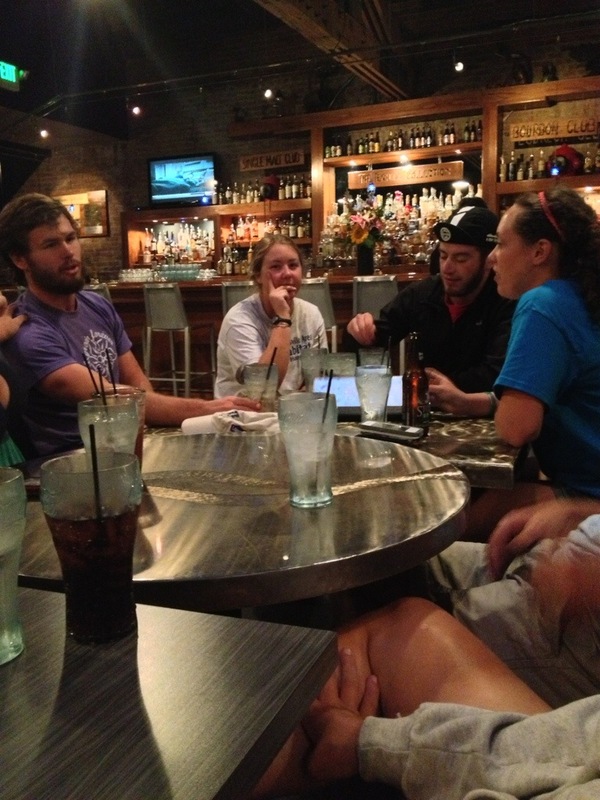 We later went out to dinner as a group, but we were all pretty tired from the day. After an enjoyable day off the bike, we were ready for an early bedtime. 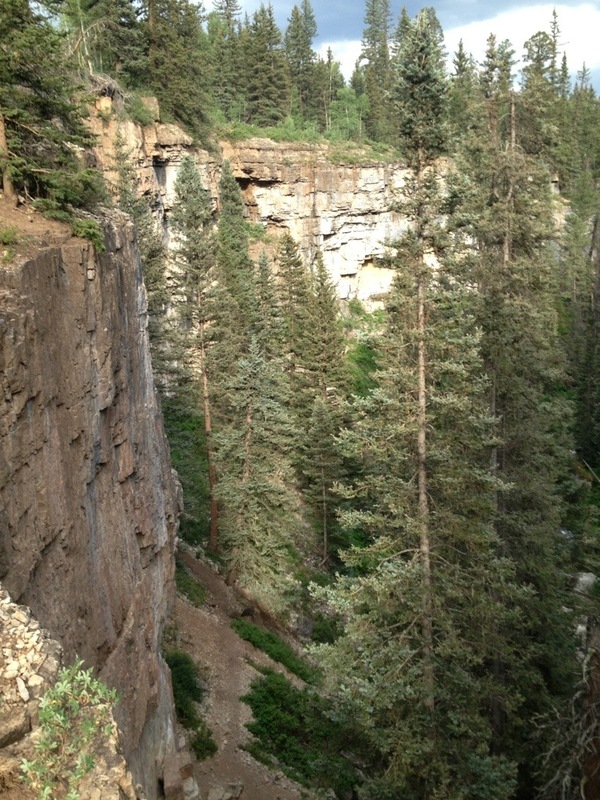 Day 51: Short 45-mile ride day to Cortez… Our last stop in Colorado!! Our leaders graciously allowed us to have a half day! We got to sleep in a little later and it was decided we didn’t have to be back at the church til 11am to start getting ready to leave. I spent my morning at that same delightful little coffee shop, cranking out the blog posts that all my loyal readers long for. You are all welcome. We left at 1:00pm, and I rode with Dietlinde all day. It was a much needed day of just hanging out with her and talking between the two of us. Not to mention, the ride was awesome!! After a few challenging climbs in the beginning, much of the day was downhill! It’s funny how 45-mile days have turned into our super easy days. It felt great to be back on the bike, but I was glad we didn’t have to hop right into a high mileage day. 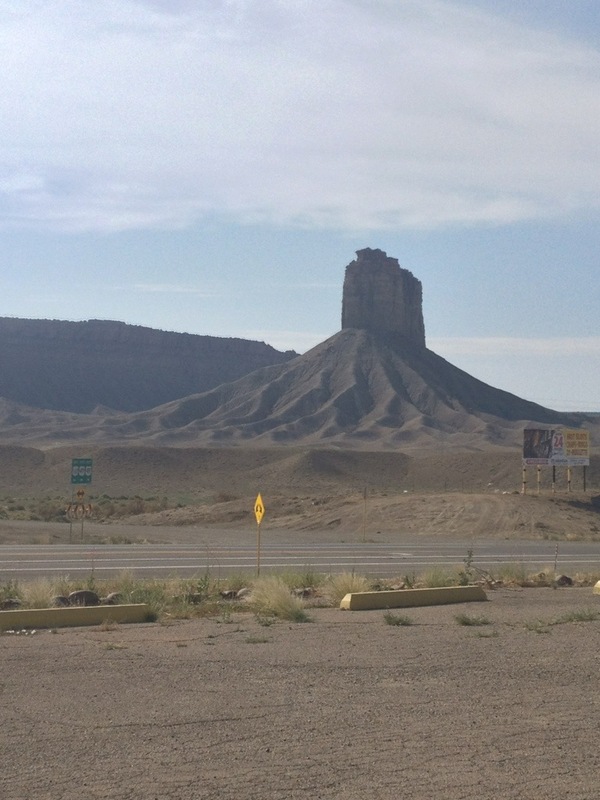 Day 52: Cortez, CO to Bluff, UTAH! I don’t really know why we go to Utah at all… We only stay there for one night and then we head to Arizona the next day. 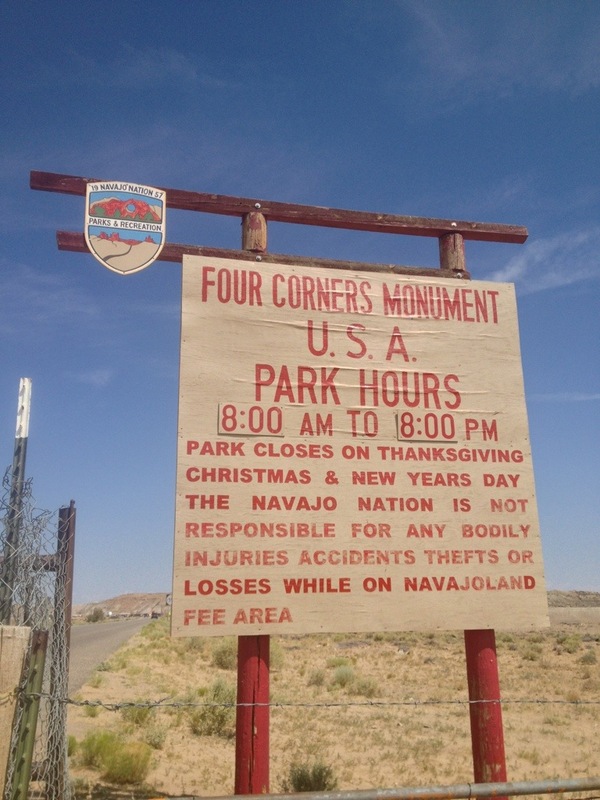 We got to the lunch spot, which was right outside Four Corners, where New Mexico, Arizona, Colorado, and Utah all meet. It’s exciting, but maybe not as exciting as you would think. And it was also a total of 12 miles out of our way to get there, which doesn’t sound like much, but every mile counts on the bike. After lunch, we made it to Utah!!! 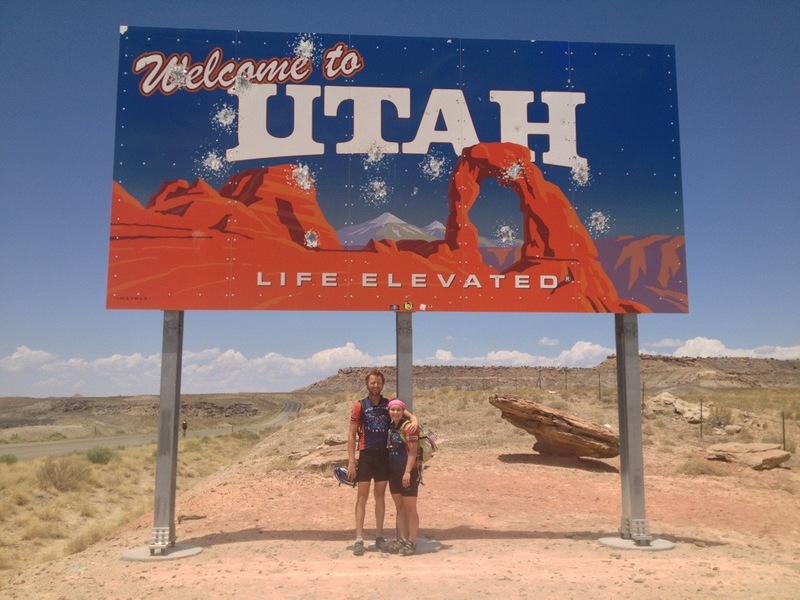 Since we’re sweep and we’re supposed to stay behind everyone else, we waited for everyone to leave from the photo opp at the Welcome to Utah sign before we followed behind them. Since the desert lacks shady spots, we huddled under the little bit of shade we could find under a rock. We soon thereafter “swept ourselves”… Meaning that I got a flat and we had to stop to fix it. 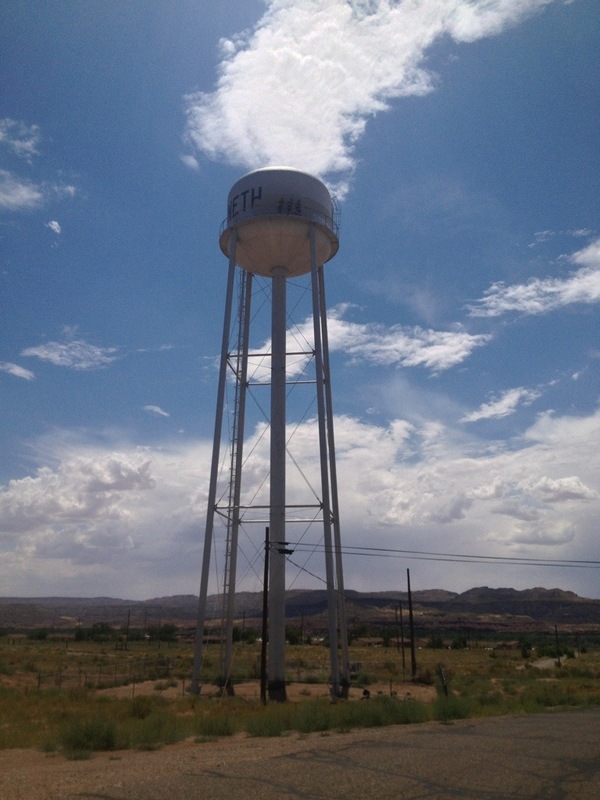 As we carried on, we saw Leader Ryan, Max, and Andrew checking off one of the items on their B&B bucket list… They had climbed up to the top of a water tower. We rode with them for the rest of the day… 5-deep sweep!! The last 20 miles were the hardest! Every time we got a slight downhill, there was a brutal uphill. It seemed to go on like this forever. Even though sweep days allow you to ride slower, sometimes being on your bike for longer combined with being in the hot desert sun for longer makes you more tired than if you had crushed it at 20mph all day. We finally got to the beautiful host site, and we settled in for the night. This entry was posted in On the road! on July 10, 2013 by murphykg. Great photos ! You are so lucky to have this great opportunity. And I am very happy that even though the heat of summer is bearing down upon us all, that your group hasn’t hit the uglier side of summer- rains, flooding, tornadoes, etc. Very glad ! And I am thankful that you have nice safe places to stay in the evenings, so many people and churches sharing spaces and food . And I love that your attitude is STILL good, still strong, after long days of up and down the hills of this country. It amazes me how much physical strength and stamina and endurance you ALL have . You could probably build a Habitat For Humanity house in a week, with all the muscles you have by now !haha I think when all is said and done, and your adventures are over, things back home will seem quite tame. I do know you have bonded with this great bunch of people, and will have friends for life! So cool ! Drink more water, too. And be careful when seeking shade under large rocks, too. There are lizards, snakes and scorpions and insects all doing the same thing ! So, please be extra careful! Your grandma got so excited today when she came over to read your latest. She does have a friend coming over tomorrow to take another look at it, but I am afraid it might have to go Geek Squad. Those guys can fix anything. It’s expensive., though. And your dad is coming down to get your granma for the weekend, next weekend, and then your Uncle Steve is going to be here for a few days the weekend after that. And in the meantime, your grandma goes to exercise twice a week, and walks with us everyday, even for just a short distance . She ( and your parents ) are so amazing. So , that’s all the news here. I will keep you updated , as well. Have fun, be careful, be safe, and drink so much you cant stand it. Desert heat is insane, and will rob your body of moisture before you realize it!